Tomorrow I will start playing in the Cal Chess Labor Day Open, which is a 3-day, 6-round Swiss. It also serves as the northern California state championship, which has been won by Sam Shankland the last two years. With Sam now “retired” (except for the U.S. Chess League), I suppose my chances of winning have gone up from one in a million to one in 900 thousand or so. This will be my first tournament since my epochal disaster at the U.S. Open last month. Two years ago, before the Cal Chess Labor Day Open, I wrote this post called “Psychological Preparation,” where I set five goals for myself. It seemed like a good idea, so I’m going to do it again, with five new goals. 2. Be glad when the game is difficult, because that means it is worth playing. This is competely the opposite of my normal frame of mind during a game, especially during last month’s U.S. Open. Typically, I start getting scared and nervous when my opponent puts up a good battle, especially if my opponent is rated lower than me. That’s ridiculous. If the purpose of chess is artistry, then I should be happy when my opponent plays the best moves. 3. Tell a story with your moves. Today I was listening to a recent ChessLecture by David Vigorito, called “Return to the US Chess League,” where he talked about not playing a move that was probably the most accurate, because he wanted a more dynamic game with more chances of winning. It suddenly struck me (although this wasn’t really the point David intended to make) that you don’t always have to look for the best move! There’s a certain amount of latitude in chess. Often there are three or four or five moves that are all about equally good. (This becomes especially apparent when you analyze with a computer.) Instead of trying to figure out which one might be 0.1 pawns better than the others, just play the move that suits you the most. Think of the chess game as a story, and tell the story that you want to tell. 4. Don’t seek absolute truth. 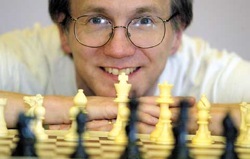 Cailen Melville has been reading a book by GM Mark Dvoretsky, who says something like this: The purpose of analysis is to identify the best move in the shortest time possible. If you are pretty sure you have identified the best move, then there is really no point in analyzing it to the n-th degree. And similarly, as I just pointed out, if there are several moves that are about equally good, again there is no point in analyzing them to the n-th degree. A good time for seeking absolute truth is in the analysis later (although Jesse Kraai would tell you that even that is a waste of time). 5. Conserve time in the first 10 or 20 moves that you will need later. My goal, since this tournament has a 40/2 time control, is to make the first 10 moves in 20 minutes and the first 20 moves in an hour. But the actual numbers are not as important as the philosophy, which is to realize that move 29 and move 37 are likely to be just as important as move 6 or move 14, if not more important. So don’t take a ridiculous amount of time on move 6 or move 14, leaving yourself with only seconds for that all-important decision on move 37. As I wrote two years ago, the most important thing about the tournament will be whether I go 5-0 in achieving these goals, not whether I go 6-0 on the scoreboard. Good luck Dana!! I hope you achieve your 5 objectives!! !